I thought it would be fun to include a pretty fall photo to announce the winner of the herb box giveaway. I looked outside and saw the pretty leaves on these vines and found my photo op. I was curious about what these berries were that looked like small grapes so I bit into one to see if it tasted anything like grapes (I know, not the smartest thing to do but I admit I taste random fruit sometimes). It didn't taste awful but it didn't taste like grapes either. I spent some time Googling "what are the vines that have berries that look like small grapes" and all I could find were "wild grapes" but I knew the leaves didn't look the same. 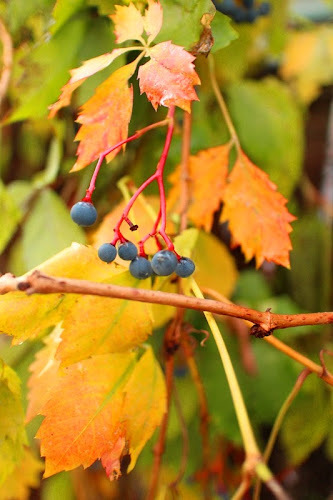 Well, later that evening I visited my blog friend Maureen at It's All Connected and saw a pretty fall arrangement she made with Virginia Creeper and it looked just like the vine in my yard! I Googled Virginia Creeper and according to Wikipedia the berries "contain oxalic acid, which is moderately toxic to humans". Eek! Well, I'm still here and I feel okay for now. She said she would put real herbs in it to use for cooking. I love that idea! Thanks to everyone who entered. You had such wonderful ideas for what to put in the box. Also, thanks to everyone for their well wishes for my Etsy shop! If you are still interested in one, please visit my shop! You can find the link on my side bar. LOL! Glad you are still here to tell us about it!! I went for a walk with a friend last week and we found this very pretty bush with red berries and I was shocked when she actually bit into the fruit. She too is still alive and well!!!! Congrats also to the winner of your herb box! Lucky lady! How funny that your friend did that. I had to laugh after reading that I'm not the only one! Congrats to the lucky winner! I loved all of the wonderful ideas, too! Your boxes are perfect for decorating all through the year! Sweet hugs! And I'm glad you're still around, too! Take care! No more tasting! Congratulations to Vel Criste. I think we are all glad you are still with us. There was much wisdom in my mothers warning to not eat anything in the woods that you don't know what it is (including berries, mushrooms or any thing else). Those are wise words indeed! Definitely never tastes any wild growing mushrooms! Your box will look wondeful in Vel's beautiful's kitchen! Aaaaaaahhhh!! So happy!!!!!!! Thank you so much Khammany!! Can't wait to use it!!!! BTW, didn't know about that, glad your ok dear... take care! So happy your are fine. Keep a good watch on yourself the next few days. Those berries are very tempting! That photo is wonderful!! Is it toxic to touch as we'll ?